Be it bronze, gold or silver, medaling at Denver’s Great American Beer Festival is cause for serious celebration. The feat means you’re the country’s finest, if but for a single moment. Winning once is tough; prevailing multiple times in multiple categories is sustained dominance on order of swimmer Michael Phelps. America’s most decorated brewer glides far beneath beer-geek radar, in California’s grape-soaked Central Coast. ￼￼￼At Paso Robles’ Firestone Walker, brewmaster Matt Brynildson, a bearded master technician, has five times been named the GABF’s brewer of the year and four times the World Beer Cup’s champion brewmaster. Additionally, his trophy chest swells with medals for pigeonhole-defying beers spanning English- inspired DBA, citrusy Pale 31, hoppy Pivo pilsner, Double Jack imperial IPA, Velvet Merlin oatmeal stout and Wookey Jack black rye IPA. Name a category and he’s nailed it. His humility and work ethic were forged in rural Litchfield, Minnesota (current population: 6,726), where his father owned a restaurant. After his parents divorced, he moved to Kalamazoo, Michigan, to finish high school while his mom attended grad school. “In many ways, Kalamazoo was the right time, right place,” Brynildson says. Kalamazoo was home to Bell’s, an early leader in the craft-beer boom. “I give [ founder] Larry Bell credit for getting me interested in craft brewing,” says Brynildson, whose high school best friend, Jon Mangee, is now Lagunitas’ quality manager. Brynildson attended Kalamazoo College, medical school his target. He studied health sciences, mainly organic chemistry, when his foreign-study program sent him to Spain. While abroad he visited Belgium and Germany, drinking in beer culture. “I came back with a greater appreciation for imported beers and classic styles,” says Brynildson, who soon started homebrewing. His partner? Southern Tier cofounder Phin DeMink. Post-graduation, Brynildson landed at Kalamazoo Spice Extraction Co. (called Kalsec), his perch in the hops lab. Brynildson pored through Kalsec’s brewing library and picked the brain of sales manager Rudy Held, Stroh’s former head brewmaster, and the company soon sent him to Chicago’s Siebel Institute to learn more about brewing. “It wasn’t until I got to Siebel that I realized I could make brewing a career,” Brynildson says. The mid-1990s were an era of rapid expansion in brewing. To find talent, breweries tapped into the Siebel pipeline, especially Chicago’s Goose Island. Typically, Hall would ring Siebel and inquire about promising students. In this case, Siebel’s Keith Lemcke (he’s currently vice president) called him. “He said, ‘We’ve got this kid from Michigan, and he’s the sharpest kid we’ve had here in a few years,’ ” Hall recalls. Brynildson was brought on at Goose’s new production facility as a low-rung cellarman, his first professional brewing job. As head brewer he refined the rich and fruity Honkers Ale, and fashioned Goose’s flagship IPA. It was bottled, but Brynildson dreamed of dispensing it via nitrogen, à la Guinness. “I don’t want to say that we were ahead of our time, but it was a pretty bold move,” Brynildson says, laughing. 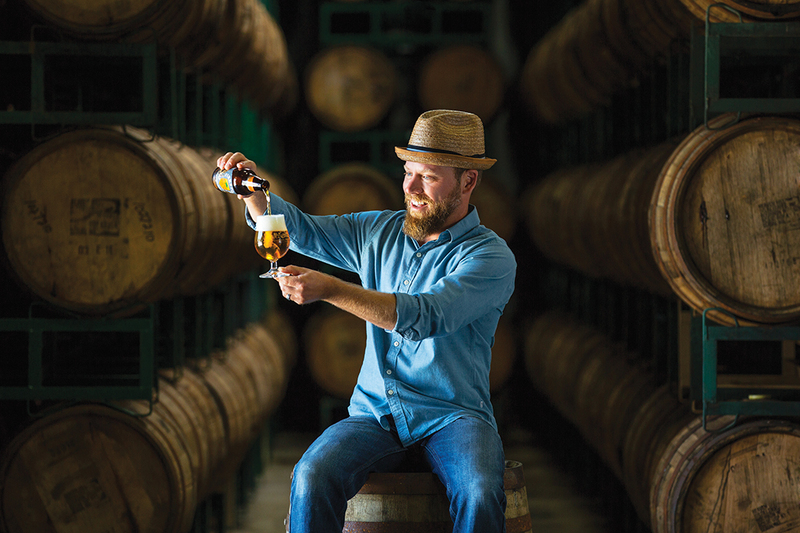 After four-plus years at Goose Island, Brynildson was ready to make a different bold move. “I had this thing in my head that I’d go to the West Coast and there would be this whole other level of brewing,” he says. In 2000, headhunters for California’s SLO Brewing contacted him. “They flew me out there and were basically like, ‘We’ll pay you twice as much money to make half as much beer and live in California’s Central Coast!’ ” he recalls. The new position necessitated a steep learning curve. Firestone Walker focused on British-influenced pale ales like the rich DBA, ￼￼￼that were fermented in an oak-barrel union system inspired by the Burton Union, which was last popular in 19th-century Britain. No brewery in America made beer in that manner. “I was like, ‘This is all smoke and mirrors, right?’ ” Brynildson recalls. Wrong. Working at Firestone Walker meant mastering the way-back contraption. “For the first few years, he earnestly wrestled with the wood, English malts and yeast we were using to optimize DBA’s quality,” Walker says. “The wood was a new challenge and he embraced it.” Though Brynildson honored the Firestone tradition of English pale ales, it was impossible to escape the inevitable. “As a former hop chemist, he was always going to follow the lupulin trail,” Walker says. His suspicions were confirmed when a local winemaker proclaimed that a pale ale seemed skunky. “I immediately made a rule that no dry-hopping could occur in the light of day,” says Brynildson. More sensible protocols have since been implemented (like painting the panels and using hop cannons), but his obsessiveness left a lasting mark. “My close brewer friends still call me Batman because of it,” he says. No matter where he boomerangs, Brynildson always ends up back where he belongs, keeping his yeast happy, fine-tuning recipes to medal-winning precision and, batch by peerless batch, making America’s best beer even better. “Our passion lies back home here in the brewery,” he says. This story originally appeared in the September/October 2015 print edition. 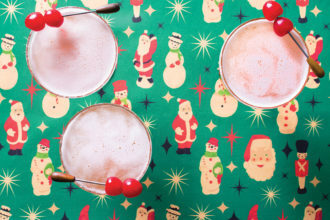 This recipe matches fruit and spice with reposado tequila.